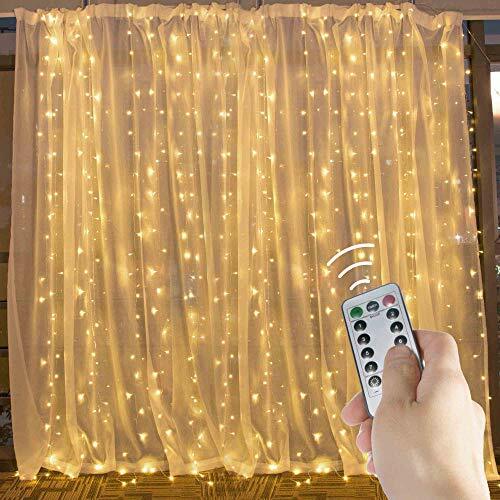 END TO END CONNECTABLE: 10ft.x10ft.fairy string curtains lights with 300 warm white LEDs, 10 ft. main strand, 19 drop strings, you can connect more strands to make longer. REMOTE CONTROL AND TIMER INCLUDED:8 light modes and timer program (6 hours on, 18 hours off) setting and adjust the brightness of the lights. It also comes with memory function, which could recover from the previous setting mode when you restart. LOW VOLTAGE & COOL TO TOUCH: 120V AC Input, 29V safe outputby plug-in transformer.The wire will not overheat and safe to touch after long time use. 8 LIGHT MODES: including combination, in waves, sequential, slogs , chasing/flash, slow fade, twinkle/flash, and steady on. Different lighting effects are controlled by remote control or controller button built on wire. WATERPROOF FOR OUTDOOR: IP44 Waterproof light wire in transparent color.Perfect fairy lights for indoor and outdoor decorations: wedding, party, home, kitchen, window, wall, bathroom, bedroom, festival, Holiday, Christmas warm up, doors, floors etc.